Time: 6:30 – 8 p.m., Check-in begins at 6 p.m.
What value do unions provide for communities and how are organizing efforts reshaping workplaces in Iowa and across the U.S.? 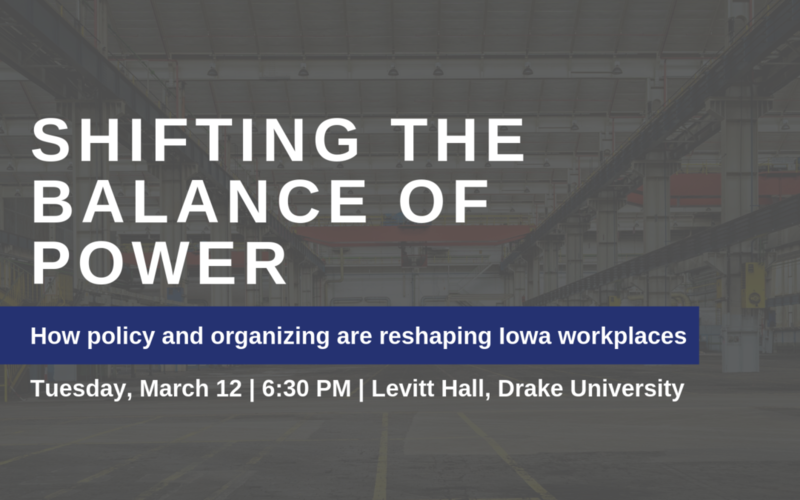 We’ll explore these questions and others during the upcoming event, Shifting the Balance of Power: How policy and organizing are reshaping Iowa workplaces, at Levitt Hall at Drake University on March 12. Labor expert Heidi Shierholz, Director of Policy at the Economic Policy Institute and former chief economist for the U.S. Department of Labor, will deliver the keynote speech. Shierholz is a member of The Harkin Institute’s Labor and Employment Advisory Committee. Registration for this event will open in early February. The event will also feature remarks from Colin Gordon, University of Iowa Professor of History and Senior Policy Consultant at the Iowa Policy Project, and first-hand stories from Iowans who are directly engaged in current workplace organizing efforts. This event is free and open to the public. Pre-registration is encouraged but not required. This event is being hosted by The Harkin Institute for Public Policy & Citizen Engagement at Drake University, University of Iowa Labor Center, Iowa Federation of Labor and the Iowa Chapter of the American Constitution Society.